Let’s not kid ourselves – creating relevant, compelling content is hard work. Many B2B blogs have failed because the authors struggle to create relevant content often enough to see results. Blogging success is a long-term endeavor but the data shows it is well worth your time. According to HubSpot’s 2013 State of Inbound Report, 82% of marketers who blog daily acquired a customer using their blog, as opposed to 57% of marketers who blog monthly. Simply put, and blogging more often equals a greater chance of acquiring new customers through your efforts. Blogging 2-3 times per week seems impossible to many B2B companies who are just getting started. Even once a week can be daunting. B2B companies often believe their industry is “boring” and that they will not be able to create content ideas often enough to be successful with blogging. Many B2B organizations, just give up on their blogs when they get stuck in an idea rut, or end up blogging inconsistently as the “inspiration” hits them. Yet, our experience proves that consistency of blogging is critical to success. Content marketing can be difficult, but coming up with ideas doesn’t have to be difficult, it can be easy and fast. 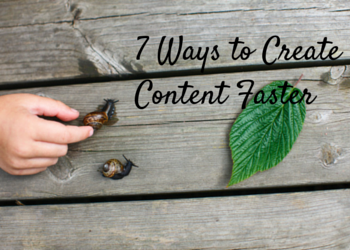 Here are seven ways to create ideas quickly. Many websites already include an FAQ section. Write blog posts that answer each of the questions in more depth. If you do not have a defined list already, meet with your sales and customer service reps to identify the common questions customers and prospects ask about your product or service. Before you know it, you’ll have 5 – 7 (or more) topics and the content needed to write engaging posts that are relevant to your audience. We’ve all read them…the how-to blog post. There are probably many things you or your organization can teach your readers. For example, a professional services firm may write a post that teaches how to write a request for proposal or RFP. A manufacturer may write a how-to on sourcing certain types of materials. The possibilities are endless. What can you teach your audience? Presentations are a part of business today. Some are created for customers and prospects. Others are technical. Some are created for industry partners or suppliers. They can reach a larger audience if you share them through your blog and social media. Turn them into a Slideshare; provide a brief introduction and another post is done. Brochures, case studies, older blog posts, proposals, white papers, e-books…we all have existing content. Review everything you have and pull relevant topics or sections from it. I bet you can come up with at least a month’s worth of topics (and most of the content and images) just using what you already have. If your organization already uses video as a selling tool, this one is especially easy for you. For example, if your company builds machinery, you probably have hours of video of the machinery in use. Pull your best clips, write a short narrative that is relevant to your buyer personas and you have a blog post. If you’re not already using video, creating it is relatively easy too. Expensive equipment is not required. Use your mobile device if that’s all you have available. Question and answer sessions with an industry expert, customer testimonials and how-to videos are all compelling video content. If you find data that is interesting to you, chances are it will also interest your customers and prospects. Share it with them through your blog. Data used in the context of your buyer personas can be an effective way to demonstrate that organization is an expert in your industry or field. Sharing relevant data used in the right context will keep your leads and contacts coming back for more. Your network goes beyond your co-workers. Invite other industry experts to contribute to your blog. This will give you more credibility with your customers and prospects by showing them that you’re always trying to provide them with the best ideas and most valuable information…even if it comes from outside your organization. Don’t let content creation get you down. It may be quicker and easier than you think. I hope these ideas have helped you generate some of your own.